I run a summer camp for children ages 5-16. I was looking for a craft project that everyone can do as a group. I came across this craft and it was a big hit. 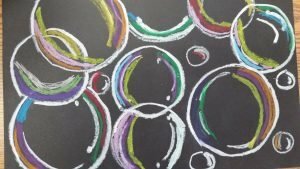 Children of all ages and trace and color the circles to make cool circle abstract art. The kids enjoyed tracing different objects and coloring the circles. We used oil pastels which the kids really liked (we don’t use the oil pastels very often). The crafts came out so nice that I collected them all and will display them at our end of summer kids art show. 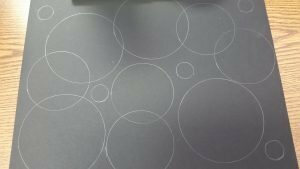 Follow the step-by-step directions below to make cool circle abstract art. Step 1: Give each child a piece of black paper, a pencil and objects to trace. 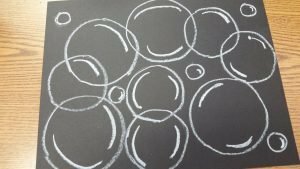 Let the children trace the circles onto their paper, letting some of the circles overlap. Step 2: Have the children trace their circles with a white oil pastel crayon. Step 3: Have the children shade in the rest of the circles using oil pastels. Kidsplayandcreate tip: If doing this craft with a group of children, connect of the pictures together to make one large abstract circle mural.